Archives de Tag: Pieter Claesz. Notes: Pieter Claesz. was one of the principal still-life painters in 17th-century Haarlem, along with his contemporary, Willem Claesz. Heda. Though the artist initially favored a vivid palette in the 1620s, he became renowned for the monochromatic still lifes characteristic of his mature period during the 1640s, like the present work, which is monogrammed and dated 1648. In contrast to the exuberant display of colors in his earlier work, the later works reveal a more subtle range of neutral tones restricted to earthy browns, warm golds, and olive greens, similar the palettes of the tonal landscapes also popular among contemporary Haarlem painters. As these colors could be applied directly onto a prepared panel or canvas and did not require the tedious application of glazes, Claesz. was able to increase productivity and meet the demand of the growing mercantile class that could increasingly afford to purchase art. The artist’s change in palette may also, in part, have been a reaction to the message of moderation preached by contemporary ministers, who cautioned against lavishness and excess. Claesz.’ masterly technical skill is highlighted by the diverse textures in the present picture: the cool metals and delicate porcelain contrast sharply with the soft folds of the tablecloth and the feathery strokes used to give the bread roll its rough-looking crust. The ruffled tablecloth and overlapping objects upon it create the sense that the scene is not necessarily posed, but could represent a real moment in time (even if the viewer knows it has been staged). This typically Baroque aesthetic, first introduced to the genre of still-life painting by Jan Davidsz. de Heem around 1635, is underscored by the dynamically painted drapery of the fabric as well as the strong diagonal running through the composition from the open pewter jug in the upper left to the herring in the lower right. Though it may appear to be set for a typical 17th-century Dutch meal, the table actually features an elaborate arrangement of delicacies deliberately chosen for their formal qualities and status as costly luxuries. In addition to a ham on a pewter plate, which occupies the center of the feast, the table also displays white bread, or herenbrood, which, as opposed to its less costly counterpart semelbrood (rye-kernel black bread) would have been obviously upper-class fare. The elegant Chinese porcelain dish and knife inlaid with mother-of-pearl would have also identified this as a meal to be taken in a wealthy home. But the specific objects may also carry a deeper significance: along with the wine, the bread may allude to the Sacrament, encouraging the viewer to contemplate the temporality of life and earthly possessions. The cracked walnut, sometimes a vanitas symbol, may have underscored such an interpretation. 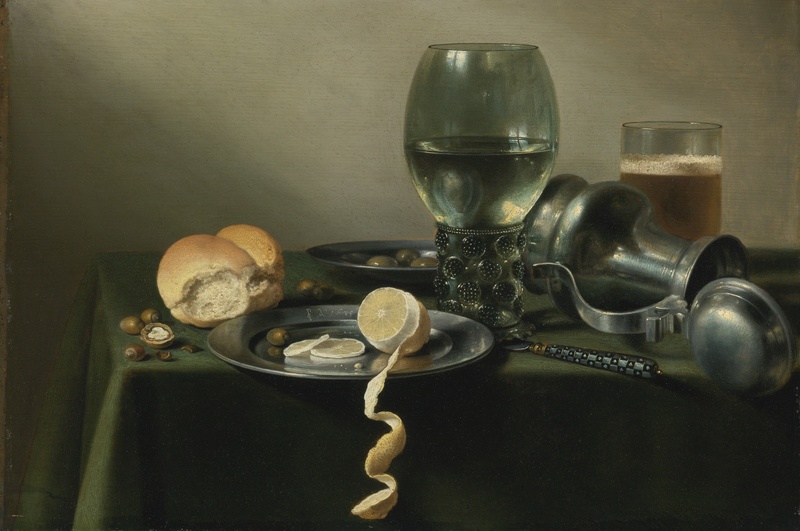 Meanwhile, the bread and beer would have also been recognized as local Netherlandish products, just as the glass roemer, a typical drinking goblet found in most homes, is shown with its distinctive exterior embellished with bits of raised glass, which served as grips for greasy fingers during a time when forks were not yet used. Similarly, the sliced herring, ready to be eaten, would have been recognized as the product on which the Dutch trading companies were founded, and may have filled a contemporary viewer with a sense of patriotic pride. Fred G. Meijer of the RKD in The Hague has endorsed the attribution to Pieter Claesz. on the basis of photographs, and Dr. M. Brunner-Bulst compares the present painting to three other still-life pictures by Claesz., two of which date to 1647 and one of which dates to 1650. She argues that these works, along with the present picture, form a cohesive group in which the themes treated and objects represented are similar, but the composition is in each occasion individual and conceived anew (see M. Brunner-Bulst, op. cit., nos. 156, 157, 186). signed with the monogram PC [in ligature] and dated Ao 1635 on the edge of the lemon dish; oil on panel; 16 1/8 by 24 1/4 inches; 41 by 61.5 cm. There purchased by the present collector. Münster, Westfälisches Landsmuseum für Kunst und Kulturgeschichte and Baden-Baden, Staatliche Kunsthalle, Stilleben in Europa, 25 November 1979 – 15 June 1980, no. 224. 2004, pp. 174-175, 178, 181, 240, cat. no. 64, reproduced p. 240. Claesz.’s early paintings, from the 1620s, are representative of the monochromatic still lifes that were popular in Haarlem at the time. The predominant colors were warm browns and olives, but the artist then added elements of local color to enliven the mix. Although tighter and more unified than the works of his predecessors, these early compositions can still be described as “additive” in nature: the view point is high and the various objects are arranged so that each can be seen clearly, with little or no overlapping, and coloring is not totally monochrome. The present work, a modest ontbijtje (breakfast piece), ushers in Claesz.’s new approach. He lowers the viewpoint, creating a feeling of intimacy and bringing us closer to the objects on the table. There are fewer pieces and they are placed more closely together. However, what is most important is his use of a central organizing principle, here a triangle, with the Roemer at the apex, the fallen jug as one of the arms and the table top as its base. Every object has a clear and well-defined place in the composition and moving even one of them would pull the composition apart. Claesz. used some of the individual elements in earlier compositions and they in fact became important motifs throughout his career. The overturned jug, for example, first appears in a breakfast piece of 1628, now in a private collection. The lemon peel dangling over the edge of the table can be found in a number of compositions, including Still Life with Tazza, in the Mauritshuis, The Hague, dated 1636, which was also formerly in the collection of Baron Willem van Dedem. This bravura element is particularly effective in the present work, where the bright yellow and white of the peel and pith is set against the dark green table cloth. Various interpretations of the meaning of Dutch still-lifes have been offered over the years. 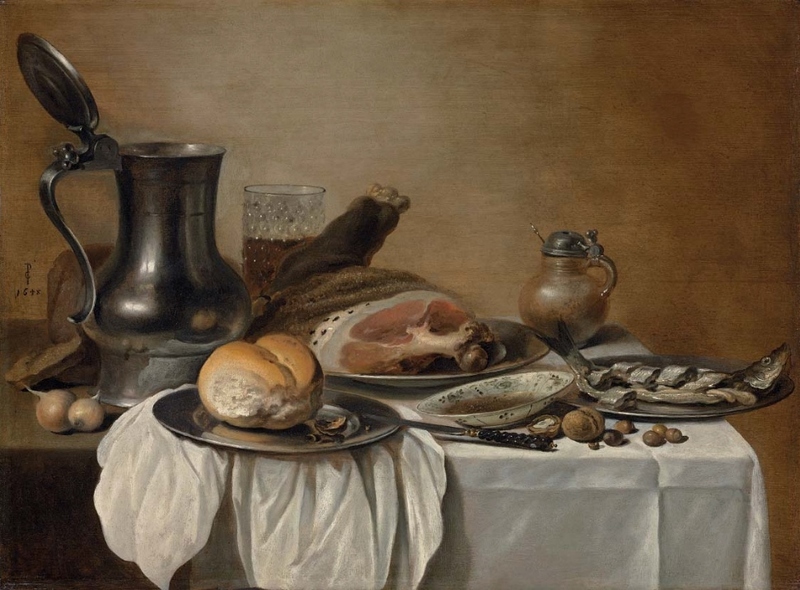 In the case of the breakfast pieces they have been described as allegories of transience, depictions of luxury and excess, or in this particular case perhaps modesty, or representations of important commodities in the Dutch trading empire (beer and bread). Scholars disagree and, in truth, we cannot be certain how a 17th century viewer would have interpreted this painting. However, what we can see for ourselves is that A Roemer, an Overturned Pewter Jug is a brilliant but simple design that is as compelling today as it would have been in 1635. 1. M. Brunner-Bulst, op. cit., pp. 174-175.